What's called “bi-cast leather” is a common furniture covering. While this composite leather looks like the real thing, it may not wear like it. We’re concerned that retailers aren't giving consumers enough information about this leather and its long-term durability. There’s some great leather furniture sold here. Karen Goa thought she’d found some – a gorgeous leather chair from Freedom Furniture for $719. She knew it was made of bi-cast leather when she bought the chair, but didn’t know what that meant. Once she got the chair home, she searched the web for information about bi-cast leather. That’s when she began to worry. Karen had left the store thinking she had bought a genuine leather product. But because we don’t have mandatory labelling of leather products, Karen wasn’t aware she had bought a chair covered in a composite material made of a synthetic bonding product (usually polyurethane) applied to an inferior section of animal hide. The polyurethane coating was treated to look like genuine leather. As far as we know, bi-cast leather is not used on locally made furniture but is found on imported furniture from Asia and elsewhere. It’s usually much cheaper than genuine leather, but even top-end Italian furniture can sometimes be covered with it. We spoke to a number of leather upholstery repairers and their unanimous verdict was that bi-cast was “awful stuff”. One repairer was of the opinion the mid-section layers of hide used in bi-cast leather “had the strength of tissue paper”. Unlike genuine leather, the synthetic surface of bi-cast leather is not porous and gets damaged by perspiration. Unlike genuine leather, the synthetic surface of bi-cast leather is not porous and gets damaged by perspiration. This can result in some bi-cast leather delaminating – the synthetic and hide layers separate, the surface cracks and the furniture “falls apart”. The bi-cast material itself can’t be repaired, so any patching must be done with genuine leather – making it difficult to match surfaces. Often reupholstering is the only option, which can be more expensive than the original purchase. Dr Warren Bryson, Director of the Leather and Shoe Research Association, told us the properties of bi-cast leather varied from manufacturer to manufacturer, and also process to process. He believed some of the better examples would perform very well, but the only way to know for sure about a particular product was to test under laboratory conditions. Bryson suggested mandatory testing of imported products to ensure they passed a minimum standard of durability would significantly benefit consumers. When we went to furniture stores pretending to buy leather furniture, salespeople were usually able to tell us which sofas were made of bi-cast leather but not much about durability. We couldn’t find any material from retailers telling us that the “leather” covering on furniture had been stress-tested in a lab. Stores that stocked bi-cast leather tended to be upbeat about the product. Where written information was available it didn’t help. Freedom Furniture, for example, calls its various leather types names such as “Deco” or “Lawson” rather than a name that describes the type of leather. There were no pamphlets or other material in-store that gave the proportion of the leather that was made from a hide (versus polyurethane) or indicated the expected life of the material. “This leather is indicative of the colour only. Due to the natural characteristics of leather, slight variations in colour and grain may occur." It’s easy to see how consumers, after reading this statement, would mistakenly believe they had bought a genuine leather product. On Freedom’s website bi-cast leather is said to be perfect in “high-wear areas”. This may be so, but without any durability test results how can a consumer know? Bi-cast leather looks and feels like high-grade leather. Even experts find it hard to tell the difference from simply looking at and pinching the material. Consumers are paying for what they believe will be a long-lasting product and they need the right information from retailers to make a good choice. the part of the hide the leather is from. Mandatory labelling would help clear up a legally grey area. In 2001 the Commerce Commission said that representing leather look-alike products (such as bi-cast leather) “as ‘100% leather’, ‘genuine leather’, or as simply ‘leather’ may mislead consumers about the real nature of the product they are purchasing". So retailers may risk breaching the [Fair Trading Act] if they claim bi-cast leather is genuine leather. We think Freedom should reconsider the labelling of its Deco samples if it wishes to avoid the possibility of a challenge from the Commerce Commission. Price is not always a good guide to quality but be wary if the new “leather” sofa you are looking at is much cheaper than sofas sold as “full-grain" or "top-grain" leather. Bi-cast leather products usually have short warranty periods of up to 2 years compared with 5 to 10 years for genuine leather. Don’t be fooled by grand-sounding Italian brand names or claims that the furniture was “designed in New Zealand”. Always ask for details. Ask your retailer where the sofa was made, which country the leather is from, what part of the hide was used, and what life expectancy it has. Get this information in writing. Try made in New Zealand for both the sofa and the leather. The major tannery in New Zealand produces leather made from the skin of the hide. We would like to see mandatory labelling of leather products and furniture. Bi-cast leather products often have short warranty periods of up to 2 years. 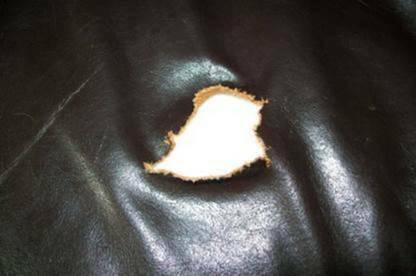 But don’t accept that you have to pay for repairs to your bi-cast leather furniture just because it’s out of warranty. Use your Consumer Guarantees Act rights and, if the retailer won’t fix it, take a case to the Disputes Tribunal. If you have concerns about your leather furniture, take it to a leather specialist and ask them to check for early signs of damage. Matt Hancock at sofa manufacturer Kadima tells his customers that if they can’t afford genuine leather they should buy a good-quality fabric sofa with a well-built frame and suspension. When a hide is removed from an animal, it can be up to 10mm thick. It’s split horizontally into sections that are thin enough to be sewn. We explain how each section of the hide is used and the names you'll see used to describe them. This is the top horizontal section that incorporates the animal's skin and is used to make the durable product most people traditionally think of as leather. It’s 1 to 1.2mm thick and has natural patterning or “grain”. Surface skin is strong, breathes (so doesn’t get damaged by perspiration), retains an attractive finish through its long life and is easy to maintain. “Top-grain”, “full-grain” and “aniline” are names used for surface-skin leather. We call leather made with the surface skin “genuine leather” in this article. This is also the surface skin of the hide but with imperfections (such as scars and branding marks) removed by buffing. Little of the natural grain will be visible in the final product and it usually has a shorter life than top-grain surface-skin leather. This is the section that was once attached to the flesh of the animal and has some inherent strength. This layer can be up to 2.5mm and is usually used for footwear and sold as suede. These lie between the surface skin and flesh layer. They have little inherent strength, as they’re the soft-tissue area of the hide where the veins once ran. These types of composite leathers can be made from any of the leather splits. However, cheap bi-cast is made from the middle splits. Products like polyurethane are then applied to the surface of the split to strengthen it.